Baskerville Publishers offers quality books for lovers of the arts, humanities, and literary fiction. We are best known for our Great Voices series, memorializing the lives and accomplishments of some of the greatest opera singers of our time, and for our quality contemporary novels. Baskerville Publishers has garnered prestigious awards for its quality literary fiction. 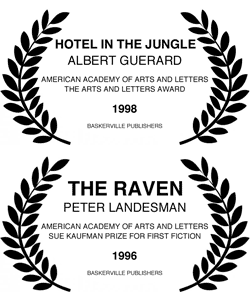 The American Academy of Arts and Letters awarded the Sue Kaufman Prize for First Fiction in 1996 for The Raven by Peter Landesman, and bestowed the Arts and Letters Award in 1998 for Hotel in the Jungle by Albert Guerard. All contents of this site © 2001-2016 Baskerville Publishers, Inc. All rights reserved. Webstore by Kensho Creative.